Situated on A904 Carriden Brae, Carriden. 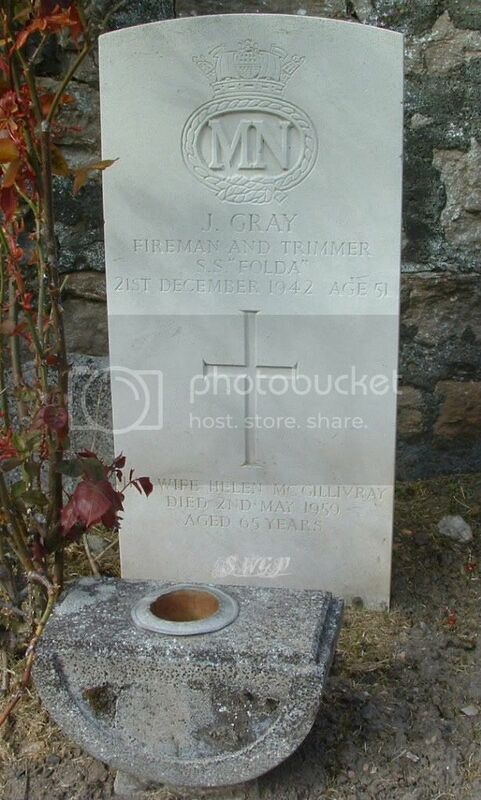 All non-CWGC stones will be listed alphabetically whether they are located in the Cemetery or the Churchyard. Grave/Memorial Reference:	East Extn. Sec. A. Grave 41. 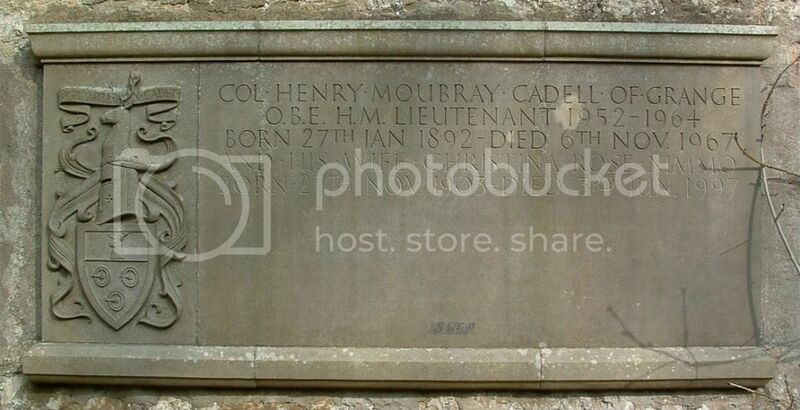 Unit Text:	476 Bty., 137 H.A.A. Regt. 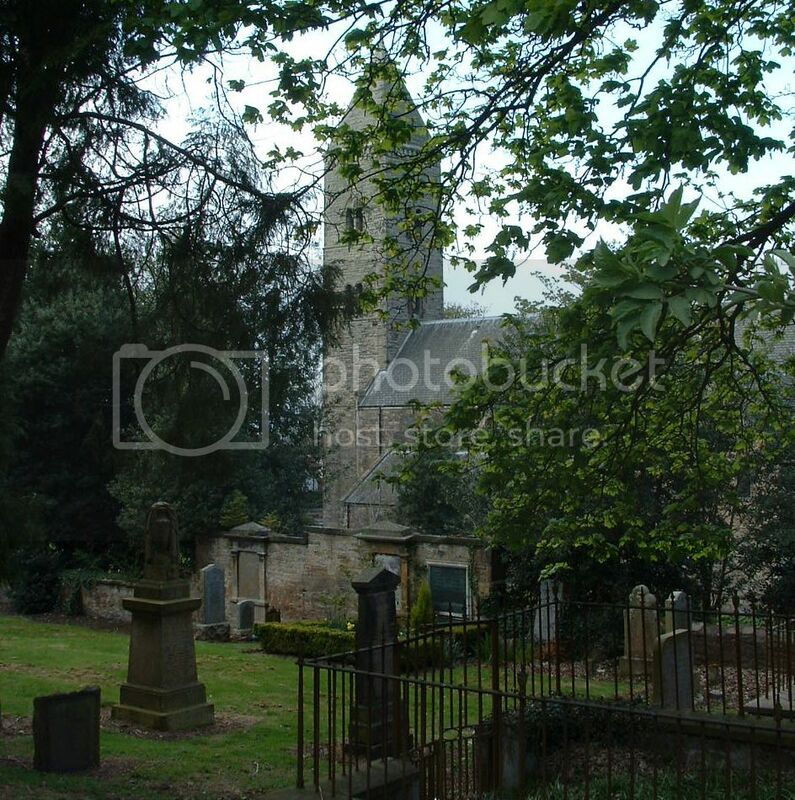 Additional information:	Son of William and Helen B. Robertson, of Bo'ness; husband of Mary Robertson (nee Stewart), of Bo'ness. Grave/Memorial Reference:	East Extn. Sec. A. Grave 44. 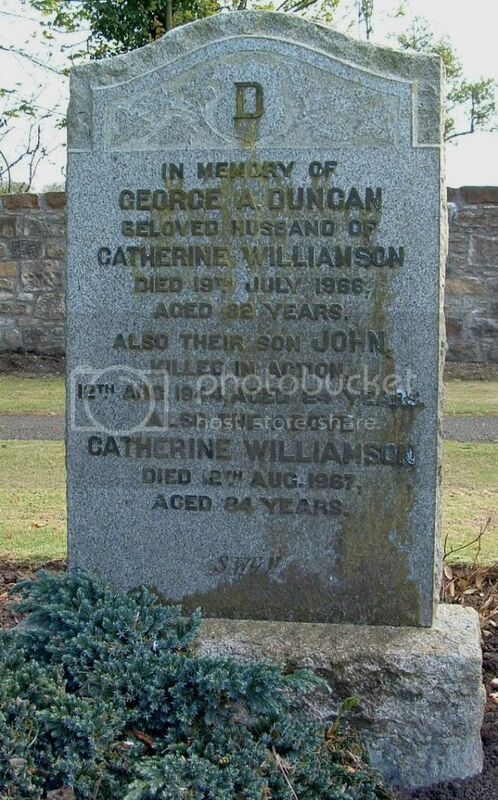 Additional information:	Son of George and Catherine Duncan, of Bo'ness, West Lothian. Theatre of death	R.A.F.V.R. B.C. 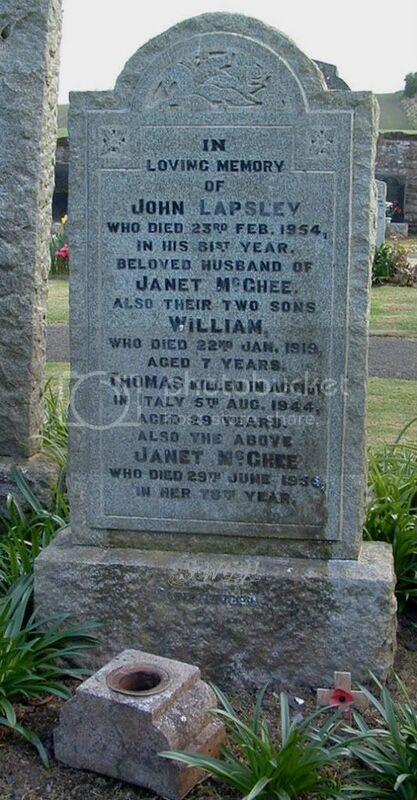 Additional information:	Son of John and Janet Lapsley (nee McGhee), of Bo'ness, West Lothian; husband of Agnes Lapsley, of Bo'ness. Grave/Memorial Reference:	VI. B. 20. 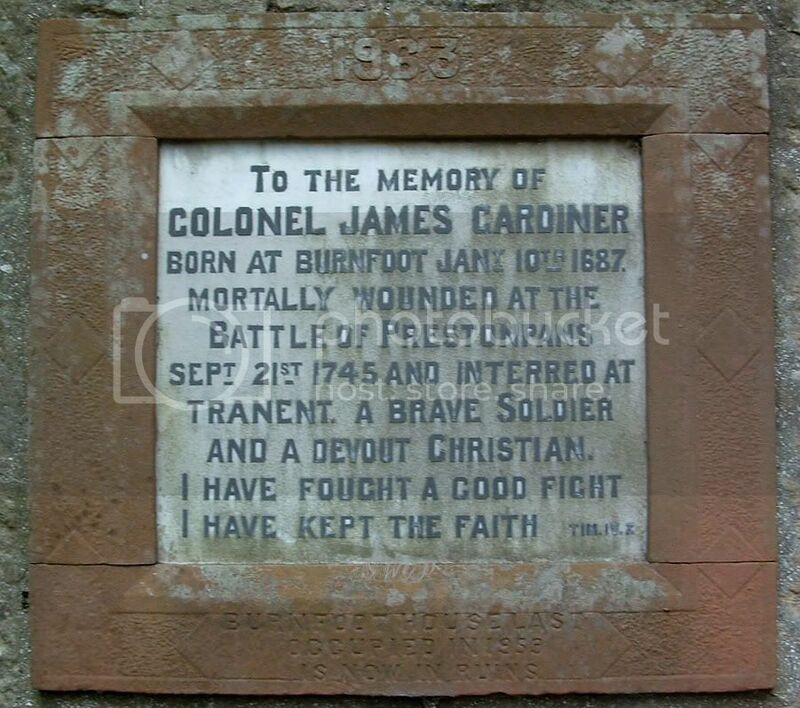 Additional information:	Son of John and Christina Muir, of I, Livingstone Terrace, Bo'ness, West Lothian. 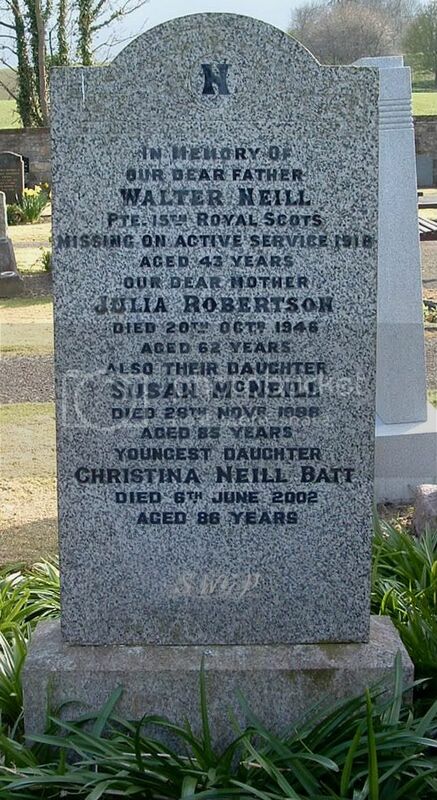 Unable to identify on either CWGC or SNWM under NEILL? Grave/Memorial Reference:	Panel 10 to 13. Secondary Unit Text:	(Mine Clearance Service). 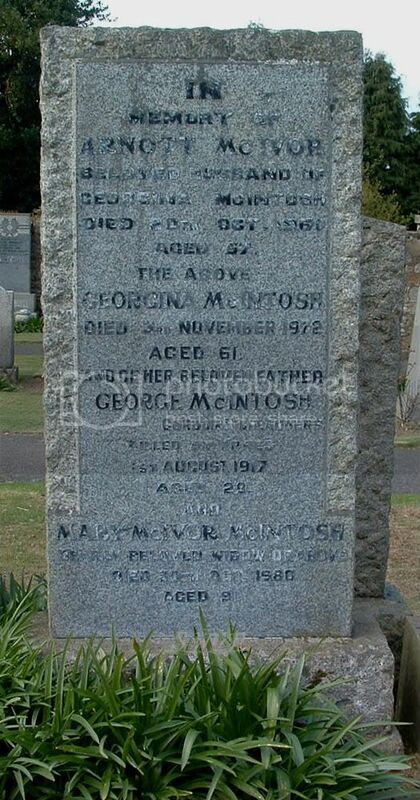 Additional information:	Son of John and Jane McVeigh (nee Marmion), of 70, Forthbank Terrace, Bo'ness, West Lothian. Native of Belfast. 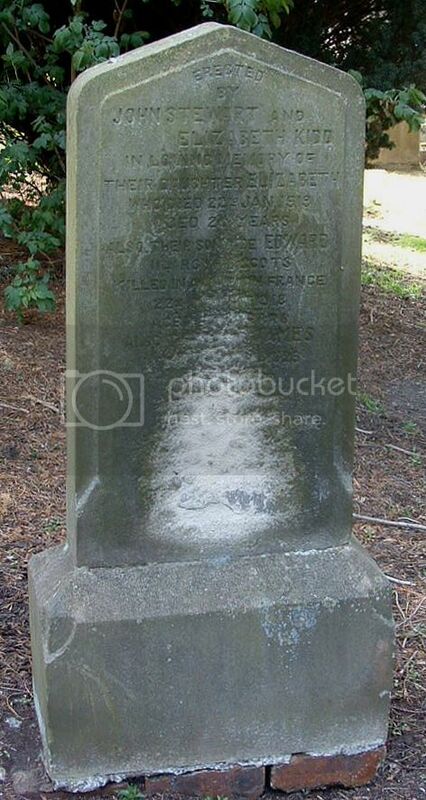 Possibly related to 2nd Lt. Joseph McVeigh in the following post as the stones sit side by side. Unit Text:	3rd Bn. attd. 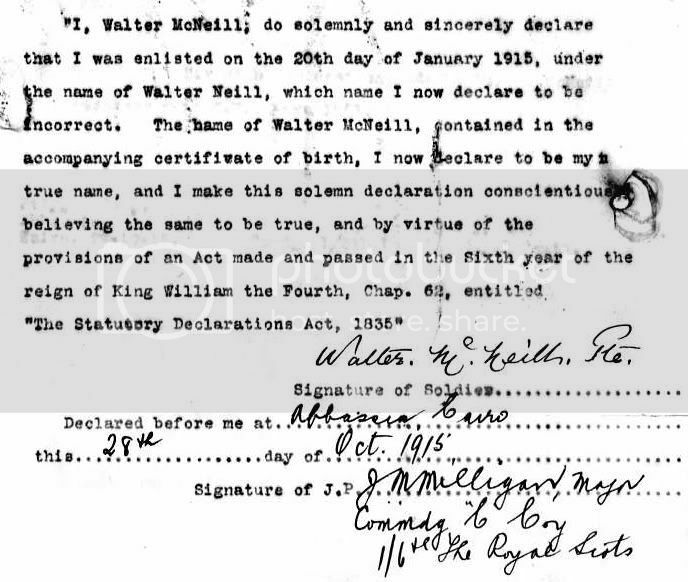 9th Bn. Other	3rd Bn. (att. 9th Bn.). 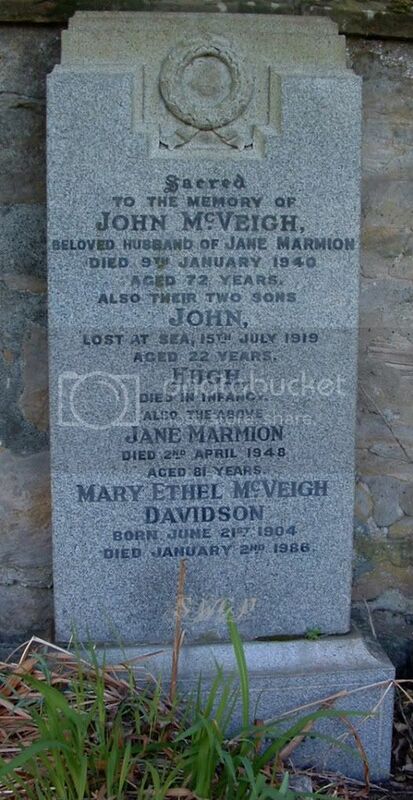 Possibly related to Stoker John McVeigh in the previous post as the stones sit side by side. 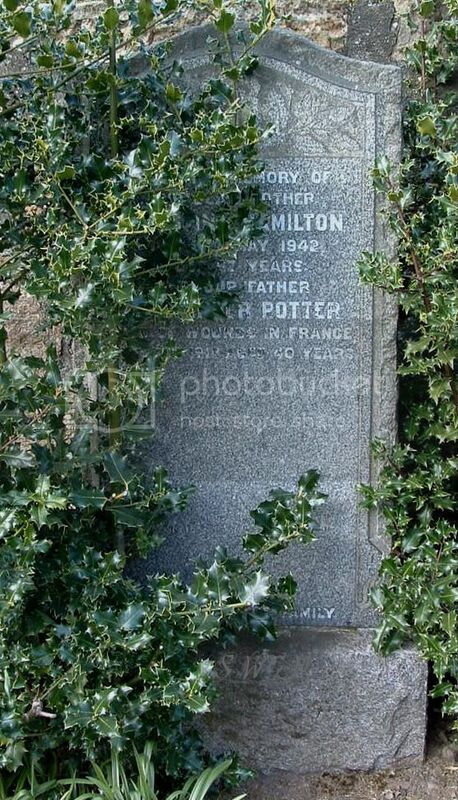 Additional information:	Husband of Christina Potter, of 10, Philpingstone Terrace, Bridgeness, Bo'ness, West Lothian. Grave/Memorial Reference:	I. F. 20. Grave/Memorial Reference:	Panel 13 and 14. Husband of Christina Rose Nimmo. Burnfoot House last occupied in 1953 in now in ruins.